Anyone who’s visited Amsterdam could tell you that while it’s “the capital of European biking”, it has serious parking problems. I’m currently teaching a class on metropolitan transport planning at the University of Amsterdam, and two groups of students have chose to study biking issues: one will examine the ever-rising rate of cycling injuries and the other the problem of parking. A recent article in the New York Times mentioned that the City of Amsterdam plans to spend 120 million euros on cycling infrastructure in the next eight years. And it should, considering that it has 881,000 bicycles for its 780,559 citizens. While car-obsessed countries might be envious, there are some serious drawbacks to cycling’s increasing popularity in a city built on precious reclaimed land: while cycling increased 14% from 2001-2011, the number of cyclists seriously injured in accidents also increased to 56%. And building enough parking spaces for bikes is as much of a problem as it is for cars in the US or Canada. Amsterdammers treat their bikes like Americans would treat a second-hand beater car with a rusted-out engine. Bikes are left out in the rain on a daily basis, they’re often left unlocked, and as one student told me, “they have little value.” Contrast this with Vancouver, where people go out of their way to rent the few coveted bike storage boxes provided by TransLink to protect them from the rain. In many North American cities it’s not unusual for cyclists to carry their bikes up several flights of stairs rather than leave them outside. Bikes are more expensive in the US (in Amsterdam you can pick one up for as little as 50 euros) they’re also more complicated: you need gears, and derailleur gears don’t respond well to daily rain. Another pervasive cultural practice in Amsterdam is owning three or four bikes; most people leave them in various places so they’ll always have access to a bike when they need one. In a city where every square centimeter of land is precious and most housing units are too small to store bikes (either indoors or out), this adds up to overcrowded bike racks, bikes blocking sidewalks, bikes affixed to every possible railing and pole, and bikes left for weeks in one place without being used. 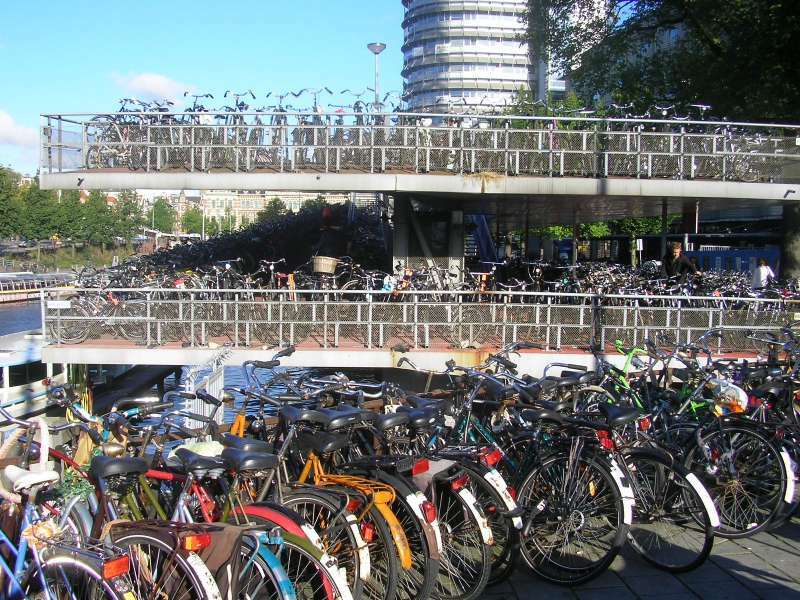 While some organizations will remove bikes left overnight (including the University of Amsterdam) this practice is controversial, as most people believe they have the right to park anywhere they want and for as long as they want. Covered bike storage is available for commuters at some places for a fee, but many people will cycle out of their way to park for free, leaving nearby neighbourhoods cluttered with two-wheelers. Shades of The High Cost of Free Parking, anyone? The City plans to create an additional 38,000 bike parking spots at the rail and transit hubs over the next eight years. 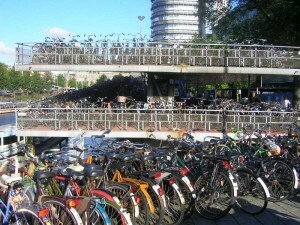 But more crucially, they plan to create more bike parking laws and enforce those that already exist, such as ensuring that Amsterdammers don’t leave their bikes for over 14 days in high-demand locations. It seems that the Dutch have discovered that unlimited free parking doesn’t work–even for bikes.